Can I watch live feed or receive push notifications from abroad? How about China? - Frequently Asked - Alfred Center | get the most out of the best home security app! Can I watch live feed or receive push notifications from abroad? How about China? We get this question often from Superheroes who are going on holiday or business trips: of course you can watch live feed as well as receiving push notifications from abroad! As long as all the devices are connected to the Internet, Alfred will work however far apart the devices are! Please make sure your Camera devices are plugged in and that you don’t press the home or power buttons after setting them up. Adding friends and family to the Trust Circle is particularly helpful if you are thousands of miles away! China however, is a different story. Alfred relies heavily on Google technology. Since Google does not operate in China for the moment, Alfred cannot function properly in China. Rumor has it that Google might enter the Chinese market soon. 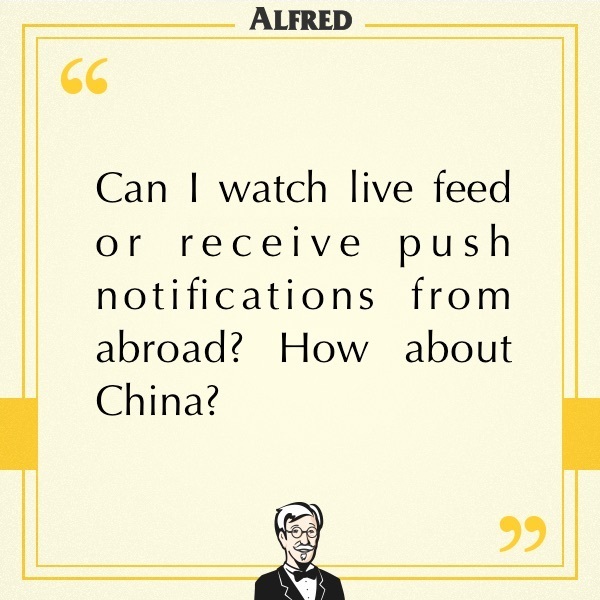 When that happens, you will be able to use Alfred in China as well!